Reviews: * Who doesn't love the classic looks of the Challenger? Beyond that, if you crave the power and sound of a Hemi V8, or simply hate tires so much that only 707 horsepower will let you destroy them quickly enough, then there's a 2015 Dodge Challenger for you. Source: KBB.com * Strong V8 engines, topped by the new 707-hp Hellcat; supple, quiet ride; room for four adults; huge trunk. Source: Edmunds * 1971 looks even better the second time around thanks to the new 2015 Dodge Challenger. The iconic heritage-inspired split grille surround and aggressive brow designs are back with attitude and new projector headlamps with quad LED halo surrounds with available projector fog lamps. The functional, performance-tuned exterior retains the Challenger design heritage with not-so-subtle air-gulping hood inlet, functional front splitter, rear spoiler and dual chrome exhaust outlets. The interior has been completely redesigned around the driver. The Tic-Toc-Tach retro-style gauges flank the new class-exclusive 7-inch reconfigurable digital cluster display. It provides a multitude of vehicle information displays, including 0-60 time, reaction time, and g-force meter. Adjust the performance of the engine, transmission, steering response and traction control with configurable drive modes on performance pages, view 3-D navigation guidance and take advantage of Pandora, Yelp, your own WiFi Hotspot, as well as other great apps from the new class-exclusive available 8.4-inch Uconnect Touchscreen. There are three paths to relentless power: a 305hp 3.6L Pentastar V6 engine, the available 375hp 5.7L HEMI V8 engine or the new available 6.4L HEMI V8 engine with an estimated 485hp. A new electronic sport shifter is paired to the new class-exclusive TorqueFlite eight-speed automatic transmission+ with AutoStick. Or choose the six-speed manual transmission, standard with the 5.7L HEMI V8 engine, and shift the gears yourself. SRT versions of the Challenger are available as well in the form of the Challenger SRT 392 as well as the Challenger SRT Hellcat which is the fastest and most powerful muscle car ever produced with a 707hp Supercharged 6.2L V8. Source: The Manufacturer SummaryLocated right off HWY 111 in the Cathedral City Auto Center.WHY TOYOTA OF THE DESERT? 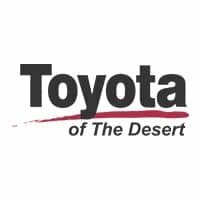 At Toyota of The Desert, we only stock the very best Toyota pre-owned and Certified Pre-Owned vehicles as well as high quality, select brands from other car companies into our inventory. We have a staff of on-site buyers and regional buyers dedicated to acquiring cars and trucks that fit your particular and exclusive needs and at prices you'll love! Then, we recondition those vehicles to strict dealership and manufacturer specifications. Additionally, we work with all credit and financial situations and do our absolute best to find a vehicle that fits every individual's unique lifestyle.Our sales staff is non-commission! That means we're interested in helping to find the right vehicle for you, regardless of price. 2013 Dodge Avenger 4D Sedan Tungsten Metallic Reviews: * If you want a car whose looks portray swagger but you can't pony up to a Dodge Charger, the 2013 Dodge Avenger just might be your style. Source: KBB.com * Strong V6 engine; lots of features for the price; composed ride and handling. Source: EdmundsLocated right off Highway 111 at Perez Rd. In the Cathedral City Auto-mall. We offer free door to door shuttle service in the valley as well as a family oriented staff and atmosphere.